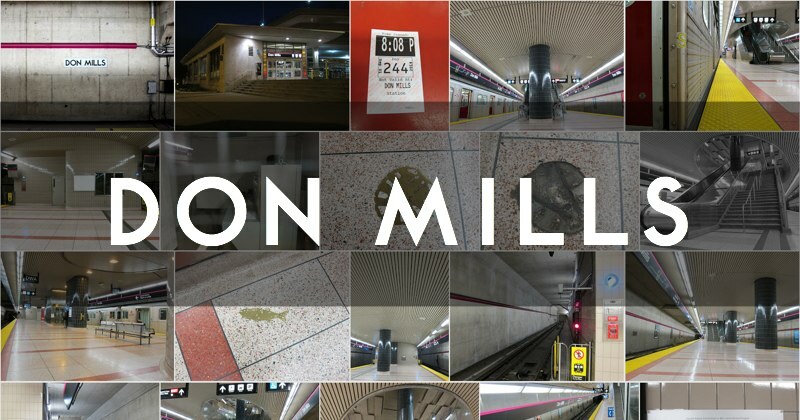 Imagine the excitement 10,000 years from now, when urban archaeologists excavate the ruins of that ancient metropolis, Tronna, and uncover the gaping caverns of Don Mills. Could I throw a nerf football the length of this vast hall? Perplexing emptiness. The coloured terrazzo is nice though. I’m being absurd, of course. But the scale of Don Mills makes you wonder, could we not have built the Sheppard stations a degree less overbearing, and in exchange completed the line east to Scarborough Centre? Or at least extended the line to, say, Victoria Park Avenue? My visit to the end of the Sheppard ‘stub-way’ cemented my jaundiced view that the line has been a regrettable waste of capital. And I’m writing this as a direct beneficiary of the heavily-subsidized route (I ride it on a regular basis). You might argue that given the political context of restraint and funding cuts in which they were designed, the Sheppard station implementations have proven more than adequate, as validations of ‘value-engineering’. They nevertheless strike me as mostly empty, arid boondoggles. And personally, if I’m going to have a boondoggle, it might as well be something nice like Downsview. I guess my real beef lies with the line’s poor contribution to the overall transit network; we would have generated much better value building elsewhere. Two artistic works by Stephen Cruise serve to enhance the Don Mills facility. With its tiled depictions of fossils, buried objects and geological strata, before/after relates Don Mills to the environment it displaced. Stations are entirely artificial, invasive constructions, and we hardly ever contemplate what came before. Do I generally enjoy pixellated artwork? No. But I appreciate the allusive references and the invitation to deeper contextual reflection. Some of the bronze floor inlays have broken off over the last decade, which is disappointing—station artwork needs to be durable! But the wall tiling is admirably sensual, on close inspection. Outside the station, the playful silhouette of Northern Dancer adorns the concealment wall for the station’s electrical substation. Don Mills is the eastern terminus of the Sheppard line. Designed by Stevens Group Architects, it opened November 24, 2002 and mostly services the adjoining Fairview Mall and bus riders from Scarborough Centre. Final note: A modest plaque to the memory of worker John Marinzel may be found at the subway platform level. Its discreet placement humanizes this otherwise ‘boundless and bare’, colossal wreck of a station.